This entry was posted on January 9, 2013 at 12:25 pm and is filed under FILM, literature, MUSIC, Mythology with tags Anthony Carreras, Anthony Hinds, Baby Leroy, Claude Rains, Cluny Brown, Curt Siodmak, Dario Argento, Dr Jekyll and Mr Hyde, Dracula Prince of Darkness, Edgar Barrier, Francis Matthews, Hume Cronyn, Jeanette MacDonald, Jimmy Sangster, Laura, Lenore Coffee, Lon Chaney Jnr, Maria Ouspenskaya, Miles Mander, Nelson Eddy, Ralph Bellamy, Samuel Hoffenstein, The Old Dark House, The Phantom of the Opera, The Wizard of Oz, The Wolfman, Warren William. You can follow any responses to this entry through the RSS 2.0 feed. You can leave a response, or trackback from your own site. 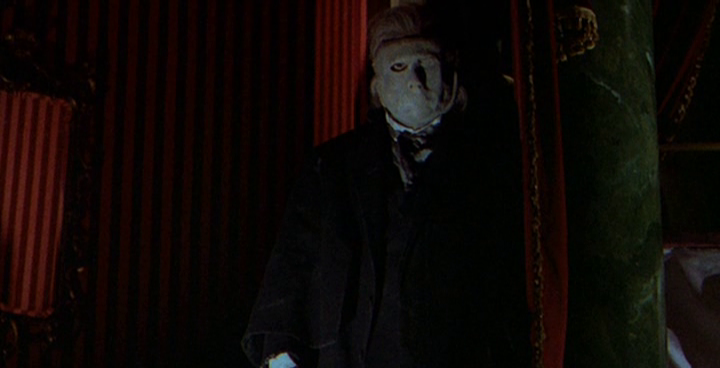 As you know, I have a weakness for the Dario Argento version of PHANTOM. The sight of Julian Sands stark naked with rats running all over him is somebody’s perverse sexual fantasy. Perhaps even mine? It’s trash but at least it’s HOT trash! Whenever “Miss” Maria Ouspenskaya appeared on film, it’s as if a reverent hush fell on the entire proceedings, and audiences were supposed to be in awe of her almost incomprehensible line readings. Clint Eastwood was Arthur Lubin’s, ahem, “protege”, circa 1956. But Robert Siodmak makes SoD much more striking visually than George Waggner’s Wolfman… It’s just a shame it doesn’t have at least a well-cast Count. Hell, I’d love to see Warren William have a crack at the part. Julian Sands’ non-deformed Phantom reminds me of the non-deformed Richard III rehearsed by Richard Dreyfuss in The Goodbye Girl — you can change characters and stories about, but you can’t remove the entire pretext! Maybe Joe Mank was a great producer-turned-writer because he started as a writer. And remembered how to do it once he became a producer. Maria Ouspenskaya is an Axiom of the Cinema. The Wolfman wouldn’t work at all without her. And neither would Dodsworth. Oh, I agree that Robert S. is a big improvement on the visual level — the jailhouse scenes and the gypsy cabin are especially atmospheric, while the way that Alucard moves around is still spooky today. I just checked to see whether Maria Ouspenskya and Una O’Connor ever made a film together, and IMDb doesn’t think so. I suppose no film was big enough to contain the two together. It’s regrettable that Siodmak didn’t get much chance to work in a supernatural vein on better projects, as he clearly had the imagination for it. Sands has always struck me as uneven. He can be terrific. Sometimes he seems like he can’t say lines at all, though. I don’t know what it is. In Gothic, Ken Russell frames a shot of Sands having hysterics to match a similar frame of Blair Brown in Altered States, but his hysteria doesn’t compare to hers. Curt Siodmak did give the world Donovan’s Brain! One day they may even make a good film of it. It was a classic of the Radio series Suspense. The Wolfman does seem disappointing to me now, nowhere close to The Old Dark House or anything by James Whale and all in all about as exciting as an amputated leg. When I was a tiny, tiny tot, however, those transformations gave me the creeps. And, yes, props to Miss Marie and Una too, while we’re at it. Nobody could shriek like Una. She’s got a great cameo as a fortune teller in the beginning of the film Victorian crime film Ivy, with Joan Fontaine. Wish that would be issued on DVD. I prefer Werewolf of London to The Wolfman, though there’s some excruciatingly unamusing “comic relief” in it. That was another thing Whale could do so well in a horror film and others couldn’t. It was always a point of honor for me, growing up, to prefer THE WOLFMAN to WEREWOLF OF LONDON. I haven’t seen the former end-to-end in a long, long time, so it’s difficult to speak with certainty, but memory tells me that the sense of narrative is much stronger in the WaGGner & Siodmak version. That plus voyeurism (Chaney and his li’l telescope) and the tragedy of Ouspenskaya and her doggerel. And I take it, btw, that “Jeanette MacDonald” above is supposed to read “Susannah Foster”? I’m almost certain it is! Though I just enjoyed JM in The Merry Widow and realized I’d rather underrated her comic gifts. Werewolf is unsatisfactory as drama but very nice visually. The Wolfman seems to have similar, yet different, problems. Neither satisfies my desire for a really good sleazy precode of Guy Endore’s novel Werewolf of Paris. MacDonald has some nice moments in LOVE ME TONIGHT, too … although one feels honor-bound to give the greater praise to Myrna Loy. Yes, Loy comes up trumps in that one. And she’s in Merry Widow too, but only for an instant. Isn’t Hammer’s Curse of the Werewolf supposed to be based on Werewolf of Paris (somehow I’ve never actually seen it to this day, though I’ve seen a lot of Hammer horror films)? My book coming out on 1930s crime fiction writer and reviewer Todd Downing, who was a great fan of the horror genre as well, has his review of Werewolf of Paris, which he called a “shudder classic.” He preferred it to The Undying Monster. There was a book on horror films I read a dozen or so years ago which really nailed the faults and virtues of Werewolf of London, as I recall, another flaw being a protagonist you can’t care about very easily. But, on the other hand, Wolfman’s lead really is distractingly badly miscast, despite the appeal of the tragic legend being carried out. As I recollect I preferred even Ghost of Frankenstein to Wolfman by a pretty good stretch. Of course Ghost has some great bits with Bela. Hull’s quite unsympathetic, yes. And The Undying Monster, though nicely shot, is something of a snooze. Chaney is badly cast as the son of an English lord, but very well cast as a guy with a problem. His saggy, worried face haunted my childhood, even in its un-hairy form. In a way, the later Universals where they throw everything at the wall to see what sticks are more diverting than the ones that try to do one simple thing, and fail. Best of all are the early ones made by people who know what they’re doing: just enjoyed The Invisible Man all over again last night. David Boxwell – Interesting titbit about Clint Eastwood. He’s always struck me as 101% heterosexual, if only because he seems to lack the imagination required to be anything else. But I could always be wrong! I’ve always longed to see End of Summer, where he co-stars with the lovely Jacqueline Bisset, but that one has always eluded me! As to why he never become a major star…well, just look at some of the people who do. Please! Did you know Anne Rice campaigned for him and not Tom Cruise to play the Vampire Lestat? It would have been definitive casting. As my Japanese friend said when Sands began his chat-up scene in Tale of a Vampire, “But… he’s obviously strange.” As in, you wouldn’t go out with this guy. But I guess some would! Siesta struck me as an unbelievable farrago, but I enjoyed the first Warlock, where Richard E Grant snatched the ludicrousness prize from Sands’ astonished fingers, and clasped it to his manly chest throughout. I guess the reason Sands’ chat-up works in Tale of a Vampire is because she’s kind of strange too. I caught a screening of Werewolf of London back in September. Hadn’t seen it in years, and I was struck by how much more sympathetic and genuinely tragic Warner Oland is as Dr. Yogami. Even though I really enjoy the film as it is, I can’t help wishing that Oland was the lead instead of stiff unlikeable Henry Hull. As for The Wolf Man, I still like it but also wouldn’t mind seeing Robert Florey’s original concept, complete with its transformation in a confessional scene. That’s so true about Warner Oland in WOL. His character is by far the best in the film. He has the element of pathos. Oland is a fascinating presence — even the story of his death is mysterious and beautiful. Poor Florey almost made a career out of getting kicked off horror pictures, didn’t he?